JNTUK 4-1 Supply Results 2019: JNTUK B.Tech 4-1 Sem (R13,R10) Advanced Supply Results Feb 2019 are declared. 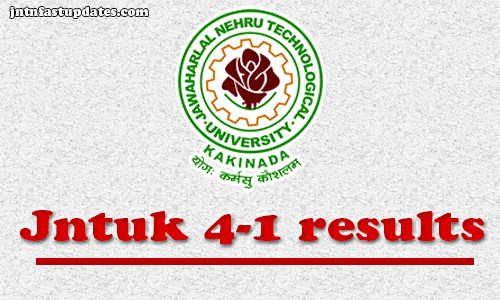 Students can check their jntu kakinada 4-1 Supply results 2019, JNTUK 4-1 R13, R10 results at jntukresults.edu.in. JNTU Kakinada B.Tech 4-1 Semester R13, R10 Advanced Supply Examination results February 2019 are announced. JNTUK B.Tech 4-1 Advanced Supplementary Exams was conducted from 18-02-2019 (Monday) and concluded on 26-02-2019 (Tuesday). So many students are wrote JNTUK B.tech 4-1 supplementary exams 2019. This Year university held IV year I semester Advanced supply exams in the month of February. Students can check their “JNTUK 4-1 Supply Results 2019” from below given links. JNTU Kakinada IV B.Tech I Semester R13, R10 Advanced Supply Examination Results Feb 2019 are Announced and Marks sheets pdf’s have been sent to respective colleges. Students can access their result at respective colleges. Last date for Revaluation/Recounting/Challenge revaluation is: 01-04-2019. 4. Your Results will be appeared on the computer screen. 5. Take print out for feature use. Sir revaluation & recounting Last day 1st, why didn't you update the link..? Are 4-1 advance supply results held in Feb 2019 for R13 and R10 released? If yes, why didn't you update the link from the past 2 days. Its not yet released in jntukresults portal.